While finding a job is difficult, companies also have a hard time hiring the right talent. Even more difficult is making valuable staff stay with the organization for a significant period of time. LinkedIn, the professional networking website, said its research found that the average staff tenure for top-hiring industries is only three to five years. 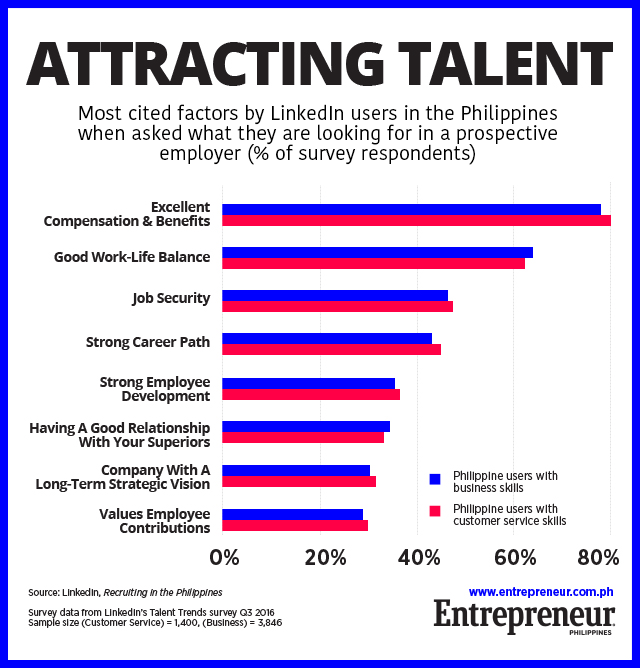 To help companies address the issue of attrition, LinkedIn surveyed over 5,200 Filipinos on its website and asked them what they look for in a company when evaluating job prospects. It published the results of its research this week in a special report titled Recruiting In The Philippines: A Special Report On The Philippines’ Skilled Workforce And How To Attract Top Talent. “Hiring the right talent is important, but one of the key issues facing organizations today is employee engagement and retention,” LinkedIn said in the report. Related story: What are the 10 Most Hired PH Occupations on LinkedIn? Companies can use the results of LinkedIn’s survey to design employee hiring and retention strategies as well as improve employee engagement. In response the question of what they are looking for in a company, respondents’ top answer was “excellent compensation and benefits.” Almost 80 percent of respondents cited pay and benefits in their reply. “Employers need to consider financial reward and proper compensation to keep talented individuals happy,” LinkedIn explained in the report. “Understanding what employees want is crucial to your hiring and retention strategy, as well as building up a strong employer brand story that differentiates your organization and positions it as an employer of choice,” LinkedIn said in the report. How Much is the Typical Filipino Depositor’s Bank Balance?